Drill Man : Secure the perimeter, people ! They could be still be here. Sean, keep on monitoring these computers. If I see so much as a GIF file loading itself, blow the thing up. Dust Man : You have to admit, this invasion plan was pretty clever. Skull Man : This particular extra-dimensional invader's civilization managed to develop Internet-based travel. Had Over-1 been slower in detecting their action, the world would be overrun with these so-called "Virtual Adepts". Pharaoh Woman : Praise be to Osiris for having this attack happen right when we were around here ! Toad Man : And I totally helped ! Right, guys ? Skull Man : *without looking at Flippy* You tripped and cried during all the fight. Toad Man : Exactly, Skeleton Man ! My tactical genius led us all to victory ! Toad Man : My brain power leaves you all in awe, I see. So, Hula Hoop Guy, what did you think of today's performance ? Toad Man : "Agile" ? "Dashing" ? That's right ! Ring Man : You can't jump ! You can barely throw acid ! Ring Man : And you're ugly to boot ! Toad Man : Yeah, I'm so handsome it's a criiii-me ~! Ring Man : You know what ? You're officially uncool. To the Box with you. Toad Man : Wh- ? I ... I'm not cool ? Bright Babe : Um, John ? I think you were kind of harsh to Flippy here. Ring Man : Huh ? *turns, revealing his DS* I was just talking about my stupid Croagunk here. Can't hold his own against that stupid Drowzee. Toad Man : He thinks I'm not cool. And if he does, then everyone else does. Maybe this explains why they feel I am ... useless. Toad Man : A cannonball ? Naaaah. Toad Man : Sir ? Sir ? You, the guy dressed like it's the 90s ! What happened ? 90s Kid : Duuuuude ! I ... I tried to open my vault full of Bloodpouch comics, and it turned out they still were THE BOMB !! 90s Kid : They were literally the bomb, too, because of some bogus fermentation. I think I'm about to die from foil-covered paper shrapnel. 90s Kid : What's your name, dude ? 90s Kid : Then, Flippy, it is to you, old friend ... well, not that "old" but, y'know ... that I pass on the Shades of Radicalness, as they were passed on to me by Rob Liefeld. Toad Man : But ... I'm not worthy ! Toad Man : Goodbye, cool kid. ... That's it ! That's an omen ! I shall become ... A COOL KID !!! Kalinka : I'm a bit worried about Flippy. It really seemed like he was down in the dumps, yesterday. Dive Man : Lit'rally or figurately ? Mind, I don't give a frak either way. Nástenka: A bit more respect, Geoff ! He's family, whether you (or I) like it or not. Drill Man : And we need him. Suppose the Soapmen finally attack ? We're doomed without his acid rain. Gunker : Mining Comrade hasn't let go of his Mr Clean conspiracy ? Drill Man : That baldy is too nice to be trusted. Skull Man : I will wake him and drag him here. Gradual force will be applied if needed.
? : *walking through the door* Are you ready for a RADICAL day, dweebs ? Dust Man : *stares at the newcomer* No ... No ! Nooooooo !!! Toad Man : Nah I don't care. Dive Man : *under his breath* Poser. Ring Man : ... The Hell did I witness ? Dive Man : *slaps John* Manners, Ringo. That thing was bliss compared ta what I saw down there. Bright Babe : Kalinka ? Is it some kind of bug he's suffering ? Kalinka : Honestly, I'm not sure. Maybe he's entered his mental puberty ? Dive Man : So, what gotcha screamin', Sean ? Dust Man : His ... his eyes ... they're in his toad-costume's mouth ... do you know how mind-breakingly terrifying this is ? Ring Man : That's it. I'm gonna join the Fatal Five if I want to keep my sanity. Staccato : What is the matter, mylord ? Riff : For a moment, I felt as if things were going to get REAL bad for us. Staccato : You mean, once Warpman joins us to breakfast ? Warpman : I'm already here, Sir Dung-for-brains. Riff : No, something worse. *shrugs* It's gone, now. Karasû : *enters the room* Companions ! Serghei decided to organize a Bomberman tournament this week-end ! Are you in ? The Fatal Five : YES ! Kalinka : No ! We are a team and a family ! We'll go through this together ! Bright Babe : After all, it can't be worse than when Flippy decided he was the new Doctor Wily, right ? Kalinka : We'll go through our planning as usual. That's my final word ! Ring Man : Stupid Flippy, skipping his turn of taking the trash out ... *hears a spraying noise* Huh ? Ring Man : What's the matter, now ? Toad Man : I'm maxxing the place, yo ! Ring Man : "Maxing" what ? Toad Man : "Maxxing" with two "X" ! Can't track up with the slang train, dad ? Ring Man : And what is this maxxing ? Toad Man : To put it for squares, I'm adding colour to the place ! Expressing my inner soul and stuff ! Ring Man : ... Really ? Toad Man : ... No. I just wanted to paint "Toad Rules, Crorq Drools". Ring Man : And yet the wall is devoid of that profound message. Toad Man : Yeah. And for some reason my hand is coated with paint. Think the paint can is leaking ? Ring Man : You ... you ... *facepalms* The nozzle is the wrong way. Ring Man : It will be a loooooong day. Over-1 : What you need to understand, Sean, is that this hyper-thaumic detector must be repaired ASAP ! What if the Virtual Adepts strike again ? Dust Man : A fine point on other threats. However, what good is a magic detector against an enemy with technological abilities ? Over-1 : I've learned over time that, for some dimensions, magic and hyper-technology are one and same. Toad Man : *enters room* Aaaayy ! Over-1 : *without looking* Go away we're busy. Toad Man : What's shaking, dudes ? Dust Man : *averting his eyes from Flippy* Your nonsensical linguo aside, we are trying to repair this magic detector here. Over-1 : *restrains Flippy* Do you understand what you're doing ? Toad Man : Pah ! This was totes lame anyway. *walks off in a supposedly cool way ... and trips on a wire* I'm okay ! Over-1 : *sighs* Please tell me we can at least salvage the device. Dust Man : You'll be surprised, but ... he fixed it. Over-1 : Huh. *checks the detector* True, that. One in a million chance, I'd say. Dive Man : Time fer smokes. Wanna one ? Bright Babe : I don't smoke, Geoff. Besides, isn't that your twelth break of the day ? Dive Man : Eh, hard-workers gotta wind down, Lite-Brite. Toad Man : Yeah, right. Hard-working fools are being played by The Man, y'know. Dive Man : Oh, look, it's Mister "Ten times cooler'n zero". Dive Man : ... shutter shades ? Eyup. Toad Man : Yeah, I covered the old ones in paint. But whatevs. Time to fight against The Man. Dive Man : What, Crorq ? Keep it fer when yer in Megalopolis. Toad Man : THE REVOLUTION WILL NOT BE STOPPED ! *pulls the fire alarm* *gets zapped* AIEEEEEE !! Bright Babe : Geoff, did you booby-trap that one again ? Dive Man : Hmm ? Nah, th' pigs disabled and rigged it after I pulled it at 2 AM for three weeks in a row. Best week I ever had. Dive Man : On th' other hand, the layer o' superglue is my contribution. Toad Man : *still charred* If attitude can't get me respect, then I know what will : EXTREME TRICKS, YO ! Skull Man : *staring* These figures, considering the aerodynamics involved, are near impossible. I predict a gruesome death by skate-impalement in the upcoming 30 seconds. Pharaoh Woman : So, pray tell, noble guardian of the Underworld, why the camera ? Skull Man : Kalinka mentioned a lack of funds. Sold to the right persons, namely "Funniest Home Videos", our income could raise in significant ways. Toad Man : Check this out, squares ! *MAD GRINDINGS* And now, the totally tubular grand finale : DOUBLE DOG DARE HELIX FLIP DELUXE DUNK !!! Skull Man : Astounding. It is physically impossible. Toad Man : *has managed to insert himself in the court's basketball ring* Uh, little help, guys ? Which is what a RUBE would say. I'm totally cool, y'know. Fine. Really. Drill Man : Team regrouped ? Alright. Wait, wheres's Flippy ? Drill Man : No matter. *over comm* Over-1, what's the status on these attackers ? Over-1 : It's weird. I suppose you're familiar with " steampunk", right ? Drill Man : Yeah. Good cover for the neo-Illuminati. Over-1 : Whatever. I guess these are " grungepunk" invaders. 90s-based technology. Neon-based camo and boom-blasters. Ring Man : Literal boom-blasters, I guess ? Invaders : BRING BACK THE NINETIES ! BRING BACK THE NINETIES ! Dive Man : We're surrounded and outgunned. Guess we'll all die. Again. Drill Man : Comrades, it's been an honour to be with you. *points at Ring Man* Except for you. Pharaoh Woman : Great Horus, grant your faithful servants a miracle ! Bright Babe : *looks* It's ... Flippy. On his skateboard. Toad Man : *arrives with a MAXIMUM DRIFT* Yo yo, what's groovin', homies ? Dive Man : 'Least I'm ta die soon. Invader 1 : Look ! The Prophet ! Invader 2 : He'll bring back the nineties ! Toad Man : They ... they love me ! *tears up* They think I'm cool ! Invader 1 : What is your command, Prophet ? Toad Man : Hmm ... Well, invading other worlds ? That's not bodacious. Like, not at all. You should, like, be groovy cats and party on, dudes ! Also, recycle TO THE EXTREME ! Toad Man : Nah but seriously peace out, dudes. 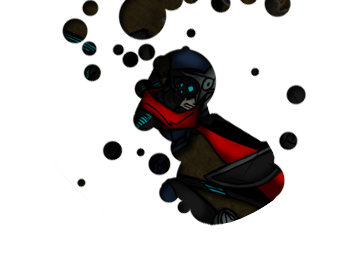 Drill Man : ... It's a conspiracy ! You planned this invasion only for us to think you're cool ! Drill Man : Admit it !
? : Ay, stop laying it on the small guy, buddy. Fonzie : *raises his thumbs* Aaay ! Flippy, right ? Toad Man : How do you know my name ? Fonzie : I'm cool like that. And I think my friend here knows you. Toad Man : *looks* 90s Kid ! 90s Kid : Duuuuuude ! After you dropped my body in the garbage, I came back to life ! But I had been replaced by Breakdancer 90s Kid, 90s Alien Robot Kid, 90s Cyborg Kid and 90s Baby ! It was TOTALLY AWESOOOOOOME ! And I'd like my sunglasses back, please. Toad Man : I can't ! How can I be cool without them ? Fonzie : *puts his arm around Flippy's shoulders* Son, you must know the truth : being cool is not about wearing sunglasses, a leather jacket, riding a bike, or talking slang. It's about being a good person, respecting others and being there for your friends and your family. And what you just did, saving everyone ? That was the coolest. Toad Man : Wow ! 90s Kid : And remember, Flippy, we'll always be in your hearts. Also, I'm 90s Kid, and what you see, is what you get ! Skull Man : This chain of events was highly illogical. Toad Man : - when the coolness was inside me all along ! Now let's go home ! Toad Man : I'll cook for everyone ! (The mass indigestion that followed was a nightmare.